as the party’s candidate, Gboyega Oyetola, appears to have won the rerun election. As electorate await official announcement from the Independent National Electoral Commission (INEC), Gboyega Oyetola was said to be leading Senator Ademola Adeleke in the six polling units where the rerun election took place. 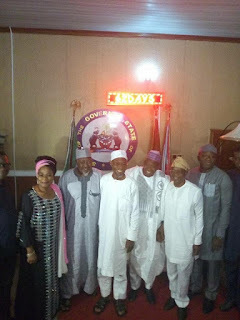 Ekiti State Governor-elect, Dr. Kayode Fayemi, his Kano and Jigawa States counterparts joined Rauf Aregbesola, to celebrate the victory of Oyetola. Meanwhile, the Peoples Democratic party, PDP, in a press statement signed by the Chairman of the party, Hon. Soji Adagunodo described the rerun election as a broad day robbery, and the most brazen assault on democracy. Adagunodo accused the ruling APC of conniving with security personnel to manipulate the electoral process, vowed to resist it in due course.